Enterprises are deploying workloads in the public cloud for increased agility and elasticity. However, they struggle to implement consistent network infrastructure across their next-generation architectures, including AWS EC2. Lack of visibility into public-cloud workloads can hinder IT’s ability to implement consistent policies for functions such as DNS and internal addressing. Infoblox DDI for AWS extends our industry-leading DNS and IP address management solution to the public cloud. Fully integrated with industry-leading Infoblox Grid™ technology and Amazon Route 53, Infoblox Actionable Network Intelligence increases cloud agility, supports consistent network policies across the enterprise, and improves visibility of public-cloud workloads. Consistently manage networks, IP addresses and DNS with a virtual appliance option inside AWS. Enterprises can ensure a uniform policy of DNS administration and network/IP address provisioning in AWS including Route 53 as well as across private clouds and traditional networks. Tightly integrated with the Grid architecture, IT teams can expand Secure DNS and the industry-leading DDI solutions across the entire enterprise. Infoblox dramatically shortens the time needed to provision new workloads in AWS EC2 by eliminating manual processes and handoffs between cloud and network teams. And when workloads are de-commissioned, IP addresses and DNS records are automatically reclaimed, which eliminates guesswork and unnecessary risks. Infoblox eliminates the challenge of tracking public cloud infrastructure by providing automatic discovery and visibility of VPCs, networks, and EC2 instances. This makes it easy to bring public-cloud assets under common DNS and IP address management. Detailed auditing for AWS resources simplifies compliance and reporting requirements. We are the industry-leading platform for DNS, DHCP, and IPAM, and the Actionable Network Intelligence platform is the only solution that offers built-in adapters, automated discovery, and out-of-the-box integration for leading virtualization and cloud platforms including Azure, AWS, VMware, Docker, and OpenStack. Instead of using legacy DNS and IPAM options, automate the provisioning of DNS records and track IP addresses for VMs with pre-built integrations with AWS. Manage and visualize your DNS, DHCP, and IPAM on a unified user interface or via APIs. Provide local controls and empower individuals or departments by delegating DNS authorization to these departments. Why build your own customized API hooks when you can leverage pre-built integrations with AWS and other automation and orchestration platforms? Meet API scaling requirements by using a distributed approach to handle peak loads while maintain complete control. Eliminate the challenge of tracking and auditing of dynamic VMs by continuously identifying and documenting virtual assets across multiple platforms with an automated discovery process. Track and audit current and historical instances to ensure compliance and maintain consistent policies. The power of cloud includes elasticity and growth on demand, so make sure your underlying network services can handle these unique requirements. 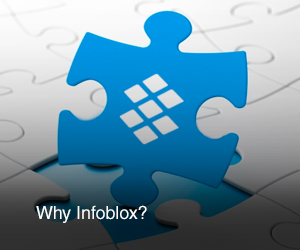 The Infoblox Grid™ and flexible deployment options ensure agility and scalability today—with a platform that can adapt and grow to meet your needs as your cloud environment continues to grow.